Hello all, I wanted to share that the fabulous Twinkle Twinkle 1st Birthday Party that my girlfriend Melanie and I put together is featured on The Creative Party Place today. Check out the feature here and let me know what you think, I would love to hear your feedback. 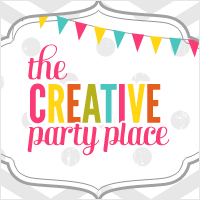 While you are at Creative Party Place browse around at all the other amazing parties to get some great ideas for your next party! How Fun Toni! You really have a gift at putting this all together. Thank you, I really do enjoy it!